Founded by a group of disciplined Puritans, Newark is often called the City of Churches for the plethora of churches found in the area. The New Haven Colony founders, Puritans who had fled England to establish a strict theocracy, were displeased by the imposed merger with their liberal neighbors. The New Haven colonists believed that only members of the Puritan church should be allowed to vote, and that only the children of church members could be baptized, strictures that did not appear in the new colony's constitution. Determined to pursue their theocracy elsewhere, the New Haven Puritans sent Robert Treat and John Gregory to meet with Philip Carteret, the new Royal Governor of New Jersey. 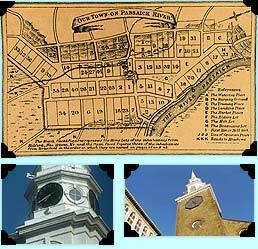 They chose a site to settle near Elizabethtown, up the bay and along the Passaic River. In May of 1666, Puritan settlers led by Treat purchased the land directly from the Hackensack Indians for goods -- including gunpowder, one hundred bars of lead, twenty axes, twenty coats, guns, pistols, swords, kettles, blankets, knives, beer, and ten pairs of breeches -- valued at $750, a percentage of which was assessed upon every family that arrived in the new colony within the first year of its settlement. Military Park was originally the training ground for the town's militia. Two major thoroughfares were created, Broad and Market streets, and the village was divided up into six-acre plots. Originally named Milford after the town in Connecticut from which many settlers had migrated, the village was renamed Newark when a formal government was first established. In 1670, the first hotel opened on the corner of Broad and Walnut Streets (now the location of Grace Episcopal Church) in the home of Thomas Johnson, Newark's first constable. Newark's first shoemaker, Samuel Whitehead, arrived in 1680 by which time the population had reached 500, and Azariah Crane opened the first leather tannery in 1698. Under the direction of its second president, Rev. Aaron Burr, the College of New Jersey (later Princeton University) moved from Elizabethtown to Newark in 1747, before finally settling in Princeton in 1756. While in Newark, Burr's wife Esther gave birth to Aaron Burr, Jr., who would later become the third Vice President of the United States. The church and government of Newark were at first inseparable. Anyone who was not a member of the church was deprived of the benefits of the Newark government. The church, in fact, was Newark's first public building, standing on Broad Street, opposite the present First Presbyterian Church. For the village's first forty years, First Church (Old First Presbyterian) was the scene of worship, town meetings, and military proceedings. Mount Rushmore-creator Gutzon Borglum's statue, Wars of America, has resided in Military Park since 1926. In 1733, a heavy rainstorm forced Colonel Josiah Ogden to harvest his wheat on a Sunday before it could spoil. When disciplined for breaking the Sabbath, Ogden decided to withdraw from the church, and began corresponding with Episcopalian missionaries working nearby. In 1746, construction of the First Episcopal Church (Trinity Church) was completed. The controversial separation created deep animosity between the townspeople that lasted until both churches were used as hospitals during the Revolutionary War.